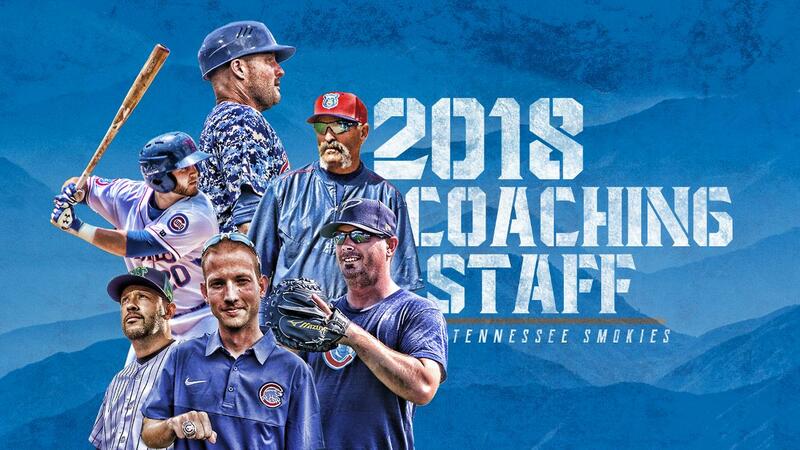 SEVIERVILLE - On Thursday, the Chicago Cubs announced their minor league coaching staff assignments for the 2018 season. The Smokies will be welcoming back two returning coaches including manager, Mark Johnson and pitching coach, Terry Clark. The Smokies have four coaches who will be making their debut with the Smokies in 2018. Jesus Feliciano will assume the role of hitting Coach, Ben Carhart will take over as a coach, Toby Williams joins the Smokies as the trainer, and Jason Morriss take over as the strength coach for the team. Johnson will be entering his third season as manager of the Smokies in 2018, and his eighth season in the Cubs organization. Johnson's teams have reached the postseason in four of his first seven minor league managerial seasons, including a Midwest League title with Single-A Kane County in 2014 and a Mills Cup Championship with Single-A Myrtle Beach in 2015. Johnson spent eight seasons in the Major Leagues as a catcher with the Chicago White Sox, Oakland Athletics, Milwaukee Brewers and St. Louis Cardinals. In 332 career games, Johnson tallied a .218 batting average with 16 home runs and 83 runs batted in. The catcher retired following the 2010 campaign after spending two seasons in the Cubs organization with Triple-A Iowa. Johnson was drafted by the White Sox in the first round (26th overall) of the 1994 Draft out of Warner Robbins High School in Georgia. 2018 will also mark the third season at the Smokies for Pitching Coach Terry Clark. Prior to joining the Cubs' organization in 2016, he had spent the previous two seasons as the minor league pitching coordinator for the Seattle Mariners. Prior to his time with the Mariners, Clark spent 13 seasons as a minor league pitching coach with the Jackson Generals (2013), Round Rock Express (2011-12), Oklahoma City RedHawks (2009-10), Frisco RoughRiders (2005-08), Buffalo Bisons (2003-04), Akron Aeros (2001-02) and the Mahoning Valley Scrappers (2000). Clark spent parts of six seasons in the Majors as a right-handed pitcher with the California Angels, Houston Astros, Atlanta Braves, Baltimore Orioles, Kansas City Royals, Cleveland Indians and Texas Rangers. In 91 career appearances (27 starts), the California native posted a 10-23 record with a 5.54 earned run average and 109 strikeouts. Clark was drafted by the Cardinals in the 23rd round of the 1979 Draft out of Mount San Antonio College in California. "We are happy to have Mark Johnson and Terry Clark returning to the Smokies for the 2018 season," Stated President and COO Chris Allen. "These coaches have strong determination and experience to lead the Smokies in the right direction. We are also excited to welcome the new coaches to the Smokies, as we will look forward to giving them a warm welcome to Tennessee." Jesus Feliciano will make his debut for the Smokies as a hitting coach after managing Single-A Eugene the past two seasons. He earned Northwest League Manager of the Year honors in 2016 and is entering his fifth season in the organization. Feliciano enjoyed a 16-year professional baseball career. Feliciano reached the majors in 2010 with the Mets and played for the Dodgers (1998-2003), Rays (2003-2004, 2012), Nationals (2005-2006), Mets (2007-2011) and the Independent Mexican League (2013) throughout his career. Feliciano batted .231 in 54 Major League games with the Mets in 2010, and also appeared in the World Baseball Classic in 2009 and 2013. Feliciano was originally drafted by the Los Angeles Dodgers in the 36th round of the 1997 draft out of Academia Discipulos de Cristo High School in Bayamon, Puerto Rico. Ben Carhart also joins the staff after beginning his coaching career as a rehab coach with Mesa last season. He had a five-year playing career in the Cubs minor league system. Carhart played for the Smokies in 2016, and posted a career .270 batting average during his minor league career. Carhart was selected by the Chicago Cubs in the 35th round of the 2012 Draft out of Stetson University. Toby Williams enters his fifth year as a trainer in the Cubs organization and first with Double-A Tennessee. Williams previously spent the past two years as Myrtle Beach's trainer, and performed the same duties for Rookie League Mesa in 2015 and Single-A Boise in 2014. Williams was honored as the Professional Baseball Athletic Trainers Society Trainer of the Year for the Carolina League in 2016 and the Arizona League in 2015. Jason Morriss takes over the role as strength coach in 2018 for the club. Morriss spent the last three seasons with Myrtle Beach and is in his sixth season with the Cubs. Prior to Myrtle Beach, he served as the strength coach for Single-A Daytona 2013-2014. Morriss earned his Bachelor's in exercise science and his masters of education in coaching and sports at Angelo State. The Smokies will commence their 2018 home campaign against the Jackson Generals on Wednesday, April 11, 2018. 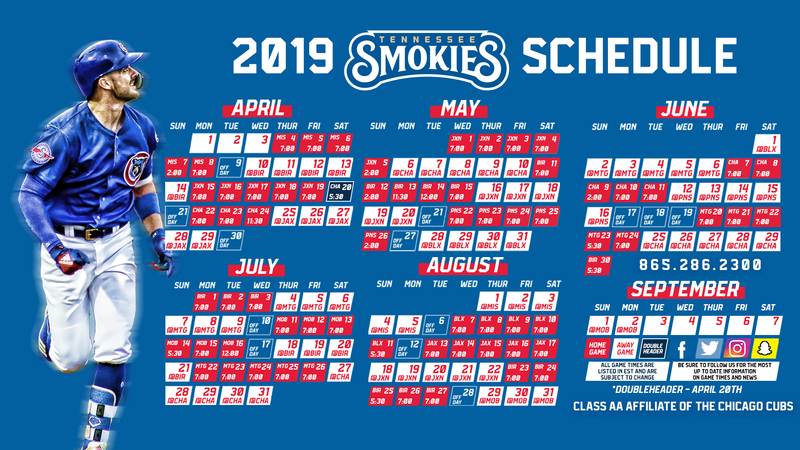 The full schedule for next season and season ticket information can be found online at smokiesbaseball.com, or by calling the Smokies Ticket Office at 865-286-2300. The Tennessee Smokies are the Double-A affiliate of the Chicago Cubs. Members of the ten-team Southern League, Smokies baseball has been entertaining families and fans of America's national pastime in the East Tennessee region for over 100 years. To learn more about the Tennessee Smokies, visit www.smokiesbaseball.com.